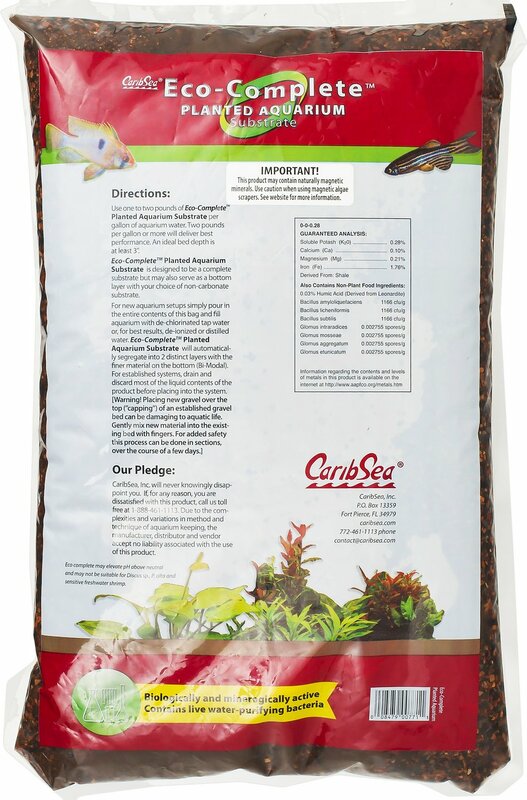 Keep your aquarium plants growing and thriving with the CaribSea Eco-Complete Planted Aquarium Substrate. This ready-to-use formula contains basaltic volcanic soil which contains iron, calcium, magnesium, potassium, sulfur and over 25 other elements to nourish your aquatic plants. It has different-sized granules that help promote optimal oxygen uptake for roots, and a blend of beneficial bacteria that turn fish waste into plant food, and nourish roots to promote healthy growth. Use it to boost plant growth and as a new aquarium cycle starter. Best of all, since it’s packed in a water conditioning solution, it’s easy to use out of the bag, with no rinsing or additional conditioners. 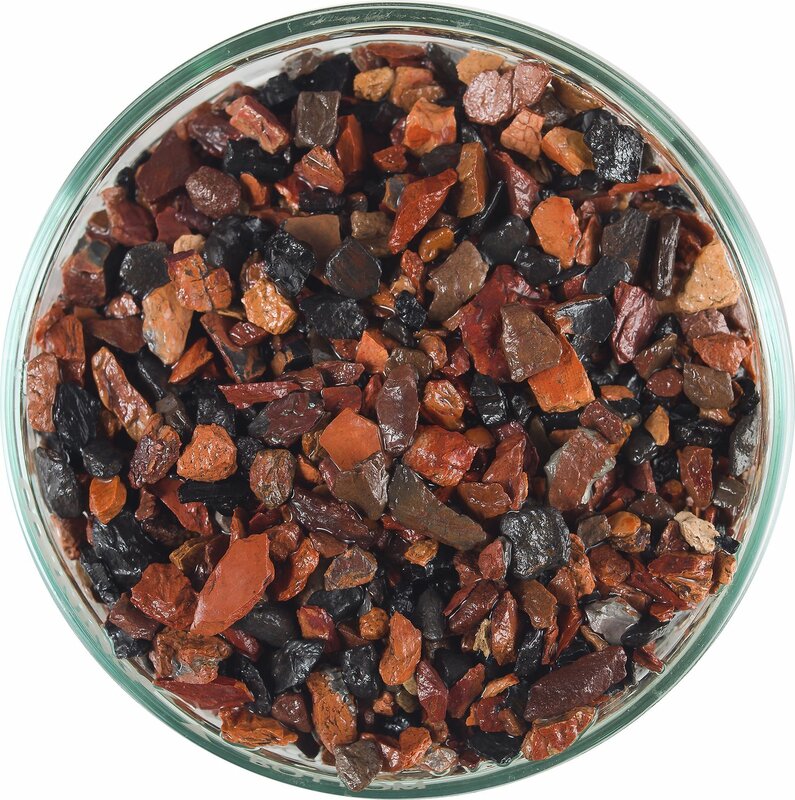 Ready-to-use with volcanic basalt rich in minerals and essential elements to support plant growth and health. Bi-modal grading separates into a fine bottom layer for root development, and a coarse top layer to enhance root oxygen uptake. Dual-biotic formula contains heterotrophic bacteria to convert fish waste into plant food, and mycorrhizal symbionts for strong root development. Biologically complete with beneficial microorganisms that help cycle new aquariums faster; it comes packed in Liquid Amazon™ water conditioner. Natural deep black color encourages vibrant fish colors and reduces stress, with no artificial dyes, paints or chemicals. 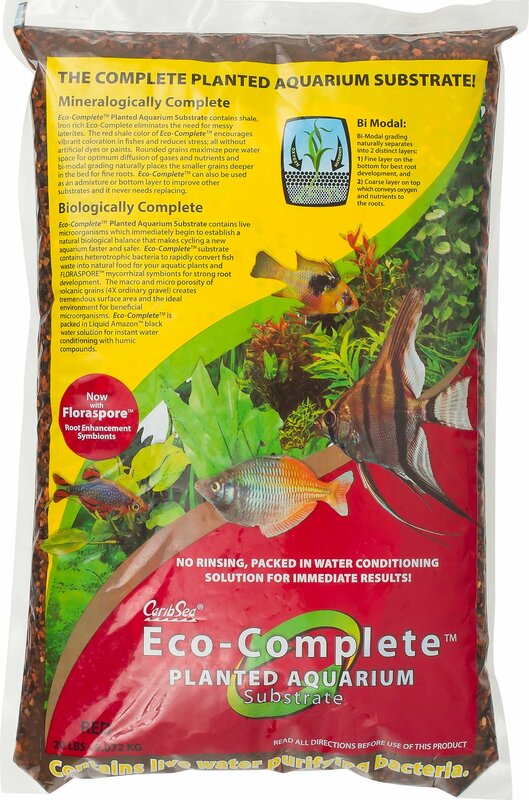 Use one to two pounds of Eco-Complete Planted Aquarium Substrate per gallon of aquarium water. Two pounds per gallon or more will deliver best performance. An ideal bed depth is at least 3 inches. Eco-Complete Planted Aquarium Substrate is designed to be a complete substrate but may also serve as a bottom layer with your choice of non-carbonate substrate. For new aquarium setups simply pour in the entire contents of this bag and fill aquarium with de-chlorinated tap water or, for best results, de-ionized or distilled water. Eco-Complete Planted Aquarium Substrate will automatically segregate into 2 distinct layers with the finer material on the bottom (Bi-Modal). For established systems, drain and discard most of the liquid contents of the product before placing into the system. Placing new gravels over the top ("capping") of an established gravel bed can be damaging to aquatic life. Gently mix new material into the existing bed with fingers. For added safety this process can be done in sections, over the course of a few days. This product may contain naturally magnetic minerals. Use caution when using magnetic algae scrapers. Fabulous for fish and plants! I redid my 75 gallon tank of tropical fish (mostly varieties of tetras) and live plants with this substrate. Amazing!!!! The plants I’d just bought have nearly doubled in size in less than two weeks and the fish are doing great. Happy and healthy. Love look of the black on the bottom that really makes the fish and plants pop. I used 6 bags (120 lb) in my 75 gallon. Super big bonus that you don’t have to (and shouldn’t!) rinse before putting it in your tank. I was a little skeptical about a substrate you don’t have to rinse but it really left my water crystals clear. I mean the rocks themselves look pretty cool being lava rock and all and it does exactly what it’s supposed to. What more could you ask for? Not only is this substrate gorgeous but it is chock full of nutrient and makes ur tank cycle faster. I added plants too, my tank is gorgeous now and looks to be the Amazon river look only neat and clean!! So good for my critters!Also arrived fast!! Eco-complete is working really well for me. I put it in a 29 gal and a 15gal tank and both tanks are doing great with the plants. Neither have CO2 and only the 29 has high light (fluval 3.0). Ordered 4 bags and no mess, no bother to use. Didn't rinse it prior and had no issues in 55 gal. tank. Planted same day and they all are doing well. Simple to use. I used this for a Planted 20 gallon Community Tank with an undergravel filter as a test run and the plants Flourished, Never lost any of the plants. I didn't use CO2 just Plant Fertilizer, occasionally. I have used other substrate for plants that clouded the water Terribly, even after several rinses, this can truly just be added as is, cloudiness for only a day! FINALLY getting My 40 gallon Dwarf Cichlid/Community Tank going and I love how it helps me to grow Live Plants without all the fuss, even the difficult ones! The Black colored substrate is much better than the Red and makes the colors of the Plants and Fish just BEAUTIFUL! Works great with plants. Comes in Red and black. Helps balance and cycle tanks. Good price. Thanks again.